After writing about beach pyjamas (or pajamas) yesterday, I thought I should show the examples I have in my collection. The pair above is from the mid to late 1920s, as you can see from the narrow legs. These are made from a very light and sheer woven wool, and I can’t help but wonder if there was originally a matching top or jacket. I love how the deep waist yoke is a nod to the dropped waists of the era. The fabric is really quite wonderful. Believe it or not, these came from the Goodwill clearance bins several years ago. I really could not believe my luck, as these are very hard to come by. These crazy quilt pyjamas from the early 1930s were also a lucky Goodwill find. At first the design looks to be completely random, but look closely and you’ll see that the maker of this garment carefully engineered the bodice, with the stripe effect mirrored in the hems of the legs. All of the pieces are silk fabrics. I doubt that this was ever worn, as the condition of the piece is so good, and there is no sign of neither shrinkage nor dye failure. This last pyjama is also from the 1930s and was an ebay purchase of about ten years ago. These have become so popular that I’d probably not be able to buy it today as the prices are much higher than what I paid. It’s is really great, with the red and blue stripes being applied to the heavy muslin pyjama. It was a much more practical garment for the beach than the rayon patchwork one was. Yesterday the question came up about when to use pajama, and when to use pyjama. Susan pointed out that the US spelling is pajama. I used both versions of the word in yesterday’s post, mirroring the usage in the primary sources I was using. Today, we use pajama for our sleeping garments, but pyjama is pretty much standard usage when referring to 1930s beach pyjamas. Correction: I originally wrote that the patchwork piece is made from rayon, but I double-checked, and the pieces are actually silk. Love the white ones! 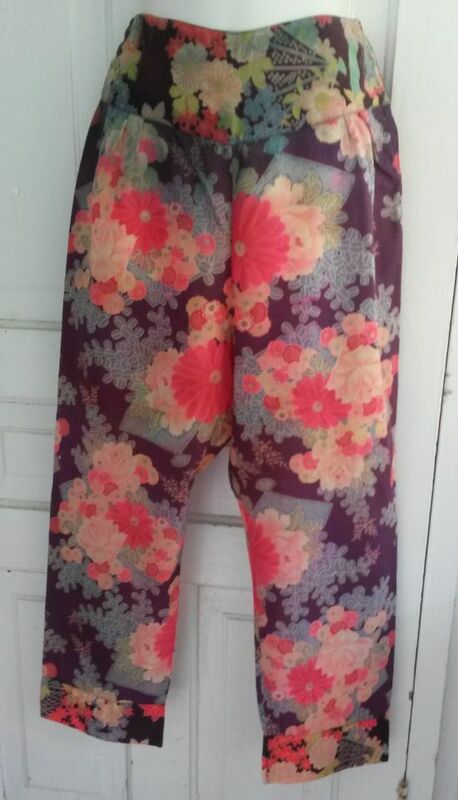 And it’s possible to imagine getting these on and off over a bathing suit. 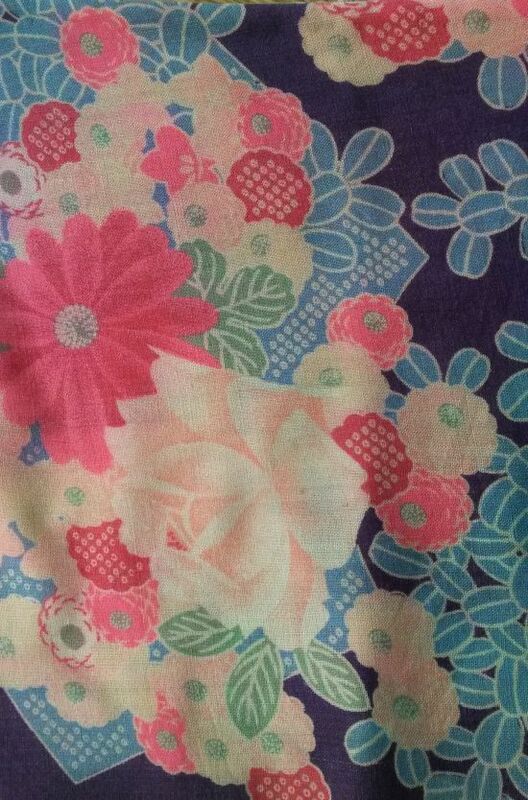 Up close, the floral print fabric looks almost Japanese. Thanks for showing these. Love them all! Isn’t pyjama Hindi or Sanskrit? “Pajamas American English, spelled pyjamas British English, often shortened to PJs, jimmies, jimjams or jammies, can refer to several related types of clothing. Pajamas are loose-fitting, two-piece garments derived from the original garment and worn chiefly for sleeping, but sometimes also for lounging, also by both genders. More generally, pajamas may refer to several garments, for both daywear and nightwear, derived from traditional pajamas and involving variations of style and material. Thank you ALL! What interesting info! I love the floral print-just beautiful – the flowers appear to float on the fabric The patchwork and stripes are a great ! All of this would make a fantastic fashion editorial photo shoot! Just so glad you saved those from the philistines at Goodwill! These are gorgeous, thanks for this post! Wonder what it’s like to wear gauzy wool on the beach. I have a vintage Rosemarie Reid bathing suit in a wool knit; even though it’s a fine yarn, it seems scratchy.